Would you consider grabbing a sandwich after you touch a toilet seat? Would you consider eating a sandwich after touching your keyboard? Out of the two scenarios above, the cleaner option is the one that involves the toilet seat. Surprising, right? Studies have found that toilet seats contain 80% less bacteria than keyboards. This is because restrooms are cleaned regularly and hygiene is a priority in offices. The keyboard and mouse are not even considered for a complimentary wipe down. This is a matter for concern and must be taken seriously. The cleanliness of computer equipment that you constantly use is very important. Humans with their quirks such as nail biting, nose digging, rubbing the eyes, etc. transmit bacteria when at the workstation. Proper care must be taken by administrators in an office to make sure that these items are cleaned as well. This not only ensures better health for the employees, it also results in more productivity and less downtime for the office. The cleaning company must also be carefully selected, and the chemicals that they use for cleaning must be reviewed thoroughly before being given the green light. Improper methods can lead to a variety of incidents that range from letters being erased from keyboards to chemical fumes affecting employees. These concerns are not limited to the office only. 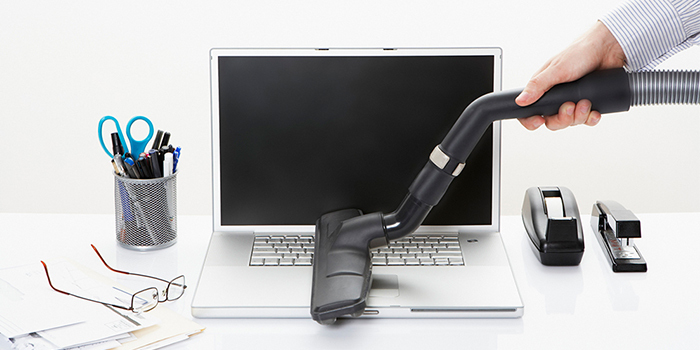 Even in your home, you should make an effort to keep your computer equipment clean. After all, good hygiene is good living.